Yes! 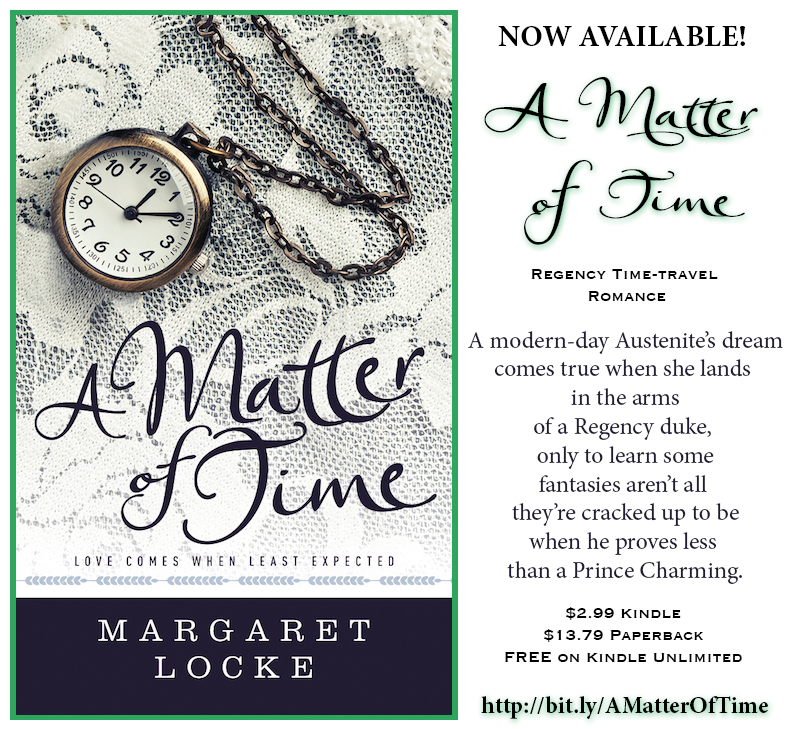 A Matter of Time is finally here, available today in Kindle and paperback format! Wahoo!!! Thank you to ALL of you for your marvelous support – you stunned me by pre-ordering 107 copies! I can’t wait to read your reviews on Amazon and GoodReads, to find out what you think of Eliza and Deveric’s story – and of course you may always drop me a personal email to let me know what you think. If only it were as easy as waltzing one time at a ball, and falling instantly in love. Cinderella didn’t know how good she had it. She’d won over her Prince with one look. The tale said nothing about the Prince having a suspicious mother or a handful of sisters. Much less a recalcitrant son. Cinderella may have occupied the bottom rung in the world in which she lived, but at least she’d been familiar with all the rules, had known the ins and outs way better than Eliza did, no matter how much she’d thought she’d known before coming here. Eliza sighed. She’d always liked Belle better, anyway. Belle hadn’t given a fig for what society thought, and ended up with that amazing library of books. After taming the Beast, of course. Ah, the Beast. He hadn’t really been a beast at all, just a wounded man looking for love . . . and acceptance. Okay, maybe he had been beastly, at first, in human form; but it was Belle’s love that had transformed him, had healed him, had accepted him, and allowed him to open his heart again. Cat had known Beauty and the Beast was Eliza’s favorite story; had she been thinking of that when she drafted Deveric’s tale? Was Eliza Belle, Deveric her wounded beast? And Regency society the mob of angry townspeople she needed to appease? Only $2.99 on Kindle, or $13.79 on paperback (though Amazon has it marked down to $12.14 – not sure how long that will last! ), and FREE on Kindle Unlimited. I am so very, very grateful to everyone who’s come into my life this year via my books – I’ve met such terrific authors and readers who are now friends, and I can’t tell you how moving that is, to know my book, my writing, touched someone enough to reach out and connect with me. Much love to all of you! 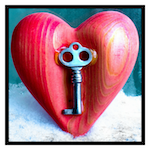 Who Are Your Favorite Romance Authors – Past and Present? 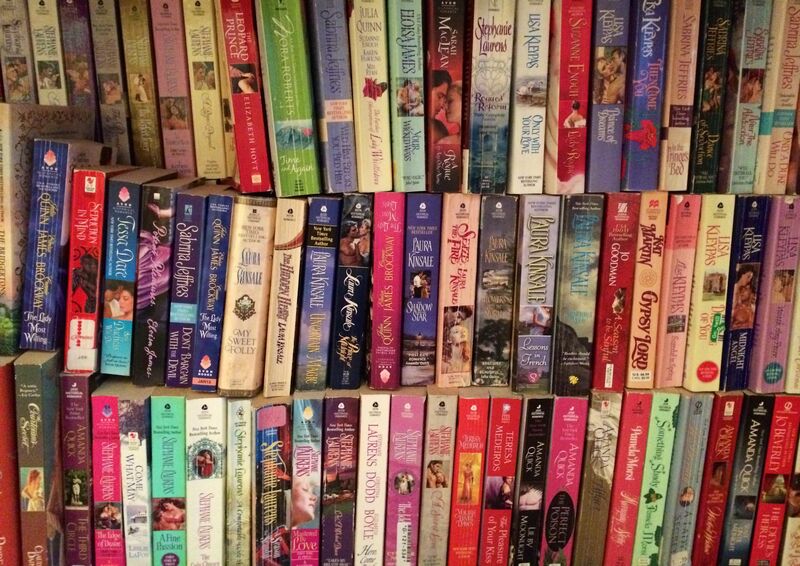 I started reading romance when I was ten years old (sorry, mom). Our local library sent a bookmobile down to the elementary school near us once a week, and one my favorite activities was browsing the kids’ books to find new reads. I quickly exhausted the selection, however–what was a bored bookworm to do? I turned around. To the adult section. Most of the titles didn’t interest me, but I found one book that had a gorgeous woman on it clad in a beautifully flowing emerald-green dress. My eyes soaked it in, and when I flipped it over to read something on the back about a pirate, I was hooked. I devoured that book in a day. It was my first romance. 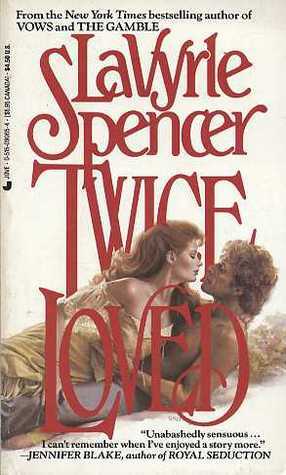 Sadly, I can’t remember the title or author, but I do remember it sparked a life-long love with the romance genre. After reading through the small bookmobile romance collection, I started saving my allowance to buy romances at the local Waldenbooks in the mall. I think the first title I ever bought was by Phoebe Conn – but again, I don’t remember much else besides loving the book (oh, the many curses of a terrible long-term memory. Stupid brain.). Other romances quickly followed, whether borrowed or purchased: love stories by Constance O’Banyon, Constance O’Day Flannery (who introduced me to my beloved time-travel romances; man, I soaked those up! ), Johanna Lindsey, Catherine Coulter. 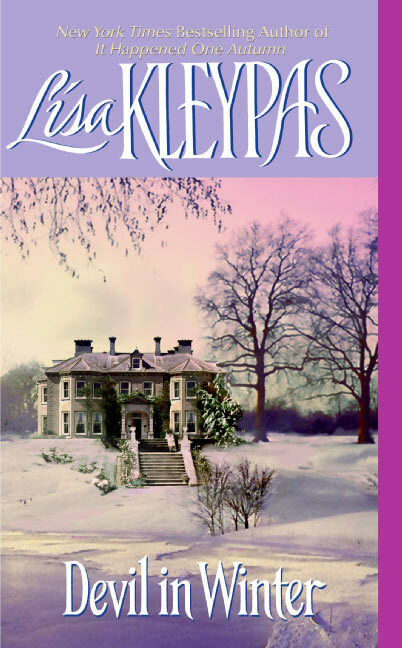 I found “older” romances and read Bertrice Small, Shirlee Busbee, Kathleen Woodiwiss. I couldn’t get enough, even as my peers and family mocked me for my genre of choice. 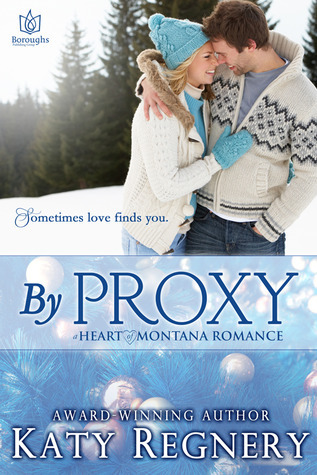 “When I grow up,” I declared, “I’m going to write romances!” I was trying to legitimize my obsession in some ways through such a statement, but in the back of my mind the idea was always there: write, write, write. In the late 80s I discovered one of my all-time favorites: LaVyrle Spencer. I LOVED (and still love) her books. I’d read an entire one in an afternoon. I read them over and over again. I couldn’t get enough. To her I added other new author loves, like Jude Devereaux (whose Knight in Shining Armor remains in my Top Five), Kristin Hannah, Elaine Coffman, Pamela Morsi, Dorothy Garlock. I hope I’m keeping the time frame right – forgive me if I’m off by five or so years. I even bought romances in German when I lived in German in 1989. I have many of Johanna Lindsey’s books auf Deutsch, and even a LaVyrle Spencer one! And yes, I read them, too. As I headed off to college, I took new favorites with me. Christina Dodd (maybe she was late 90s – again, faulty memory), Jane Feather, Susan Johnson, Laura Kinsale, Betina Krahn, Lisa Kleypas. Ah, Ms. Kleypas. I bought her debut novel. I was stunned to see we were around the same age. That again fueled the belief, the hope, that if she could write romance, so could I. Then I stumbled on to Lynn Kurland. Ah. Lynn Kurland. Another time-travel romance writer who wrote my favorite romance of all time, Stardust of Yesterday. By this time, I was in graduate school. The goal was to obtain that doctorate in medieval history and land a professorship somewhere. Writing novels seemed so far removed from a viable choice that I didn’t think about it anymore. My novel collection dwindled, as well–after one particular ribbing from my family I boxed up all the books I had and donated them to the library. Score for the library, but oh, how I wish I still had them. 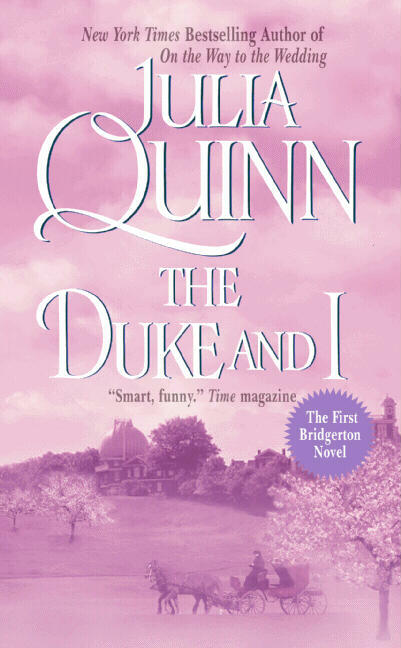 That is, until I stumbled across Julia Quinn‘s The Duke and I. And the love affair flamed anew, fast and furiously. I consumed her Bridgerton series as quickly as I could, then discovered Jo Goodman‘s Compass Club quartet, which was delicious. Next followed works by Eloisa James and Sabrina Jeffries–if you haven’t read them, you are missing out! Not only was I back in love with romance, but I’d found a whole new set of authors and a time period which enchanted me completely. In the past (and still some today) I read lots of medieval romances, American west romances (gotta love those sheriff and schoolmarm ones), some set in Russia, some in Europe. I loved them. I still do. But it’s the Regency which feeds my fantasies now, so most of the books I’m seeking out are set in that era. New discoveries are enriching my romance novel experiences, as well. I’ve fallen in love with Katy Regnery and her emotionally evocative yet simple writing style (even though she doesn’t write Regency! 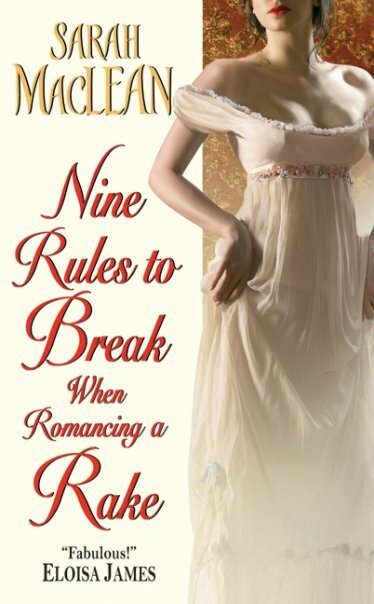 ), and Sarah MacLean‘s Nine Rules to Break While Romancing a Rake has leapt into my Top Ten, I’m sure. I’ve a number of Tessa Dare and Erin Knightley books in my To Read pile, and I’m looking forward to them. In truth, my To Read pile must number at least 100 books, if not more – and that’s not including the titles I’ve downloaded to my Kindle. Will I ever read them all? I don’t know, but it’s the kind of quandary I love to have. So there’s my recounting of the authors who’ve left indelible marks on my aging brain through the characters and stories they’ve brought to life. I’ve probably missed at least a few. Now I’d love to hear from YOU. Who are your Can’t Miss authors, whether recent or classic?